Riding a motorcycle is a freeing experience. You are the king of the road and in charge of your own destination. But motorcycles, unfortunately, are the subject of accidents that can cause serious and grave injury. When a motorcycle accident occurs, you do have a right to protect yourself and get the compensation you deserve for your injuries. Just like a car accident, you can seek a settlement for your injuries from a negligent driver’s insurance company. Often times, these settlement offers are low and not a fair representation of the injury and property damage you suffered. While your lawyer can help to negotiate with an insurance company to get you’re a larger settlement offer, you may have to take the matter to court to get more. Filing a lawsuit against a negligent driver that caused your motorcycle accident, is often the only way to receive the compensation necessary to cover your losses. Depending on the severity of your injuries, a lawsuit can provide you with the opportunity to get the compensation that covers the damages you have undergone. Knowing exactly what your motorcycle accident is worth, is dependent on a number of factors. The circumstances of every motorcycle accident is unique, and the compensation that you will receive varies greatly. 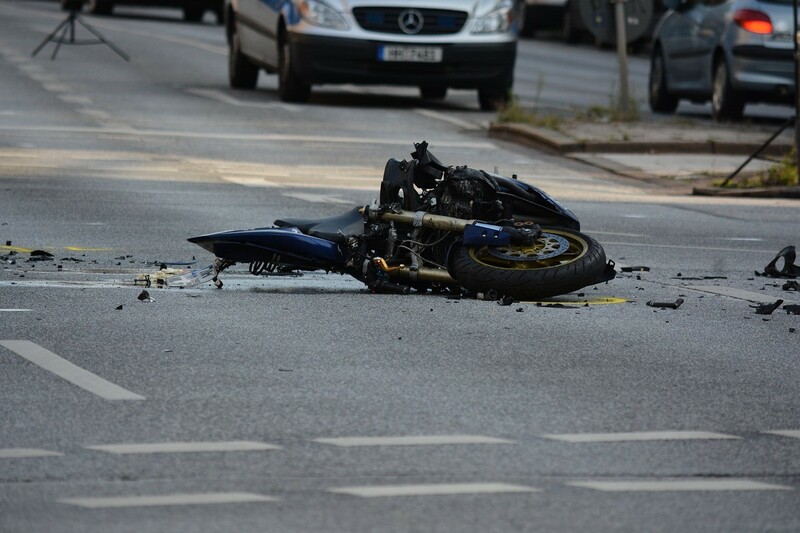 If you are involved in a motorcycle accident, there is a good chance that you will sustain injuries. These injuries may need medical treatment that can be costly. You have a right to payment of your medical expenses as part of your settlement offer from a motorcycle accident. These damages can cover your current medical treatment, as well as any future medical care you may need. Your motorcycle accident may have also caused damage to your bike. You may need repairs or a replacement of your motorcycle after the crash. These damages can be requested as part of your settlement, so you can get back on the road after your injury recovery. Often times, the events of a motorcycle accident can be emotionally and mentally painful. You may have intense pain and suffering that makes it difficult to perform your daily routine without the accident coming to your mind. This mental anguish can be sought in a settlement to provide you recovery of the pain and suffering damages you have endured. In some instances, you may request punitive damages as part of your motorcycle accident settlement. Punitive damages are awarded above and beyond your total settlement. These damages are typically rewarded to further punish a negligent driver that engaged in a particularly egregious behavior. Punitive damages act as a deterrent to prevent other drivers from performing the same actions in fear that they will financially have to pay a larger settlement if they get in an accident. While your settlement reward is dependent on the severity of your injuries and the damages you have endured, having a lawyer on your side can help. They can give you an idea of what you can expect for compensation after a motorcycle accident. They can also provide you with the legal advice you need to decide what the best course of action is in your case. Keep in mind that you may request specific losses for your injuries, but in a court case, the jury will decide how much you will be compensated. They will consider your percentage of fault which can affect your total settlement award amount. Working with legal counsel can provide the answers to the questions you have about a motorcycle accident where injuries are involved. They can also advise you on whether you should accept a settlement from an insurance company or fight for a fairer settlement in your case. It is best to speak to your attorney about your motorcycle accident as they can determine if you are entitled to compensation because of the actions of a negligent driver. Remember that there is a limited amount of time to file a lawsuit in a motorcycle accident, so you need to act quickly to receive the settlement award you are owed.